At least 15 Hindu temples were vandalised in central Bangladesh as a Facebook post deemed offensive to Islam sparked massive outrage in the Muslim-majority nation, prompting authorities to take legal action on Monday. Temples in Brahmanbarhia district's Nasirnagar were vandalised and over 100 houses of Hindus in the area looted on Sunday, sparking panic in the minority community. "We have arrested nine persons so far finding their direct links to the attacks as the authorities of these temples filed two cases," Brahmanbaria police superintendent Mizanur Rahman said over phone. A Hindu youth, who allegedly posted the 'blasphemous' content on his Facebook account sparking the outrage, was also arrested over causing the unrest, Rahman said. "The situation has calmed down as leaders of Muslim and Hindu communities and civil society figures jointly staged a peace rally at Nasirnagar calling for restraints," the district police chief said. Police and residents in the neighbourhood earlier said the social media post sparked the outrage when six temples and some 20 Hindu houses in the neighbourhood were raided. "We immediately sent police in riot gears to the scenes of the violence and quelled the situation dispersing the mob," a police officer of the nearby police station told media persons. Paramilitary Border Guards Bangladesh have been deployed in Nasirnagar and Madhabpur Upazila headquarters along with the Rapid Action Battalion, police and Armed Police Battalion, bdnews24.com reported. The district's Deputy Commissioner Rezwanur Rahman and Superintendent of Police Rahman inspected the area later in the afternoon. Locals said it all started with a Facebook post by one Rasraj Das from Harinberh village under Haripur Union Parishad. Police detained Rasraj on Friday immediately after the allegation of blasphemy had surfaced against him. He was sent to jail following a court order, according to Rahman. A report in local daily, Daily Star said about 500 anonymous people were sued in the two cases while another media report suggested the number of Hindu houses that came under attack was 100. 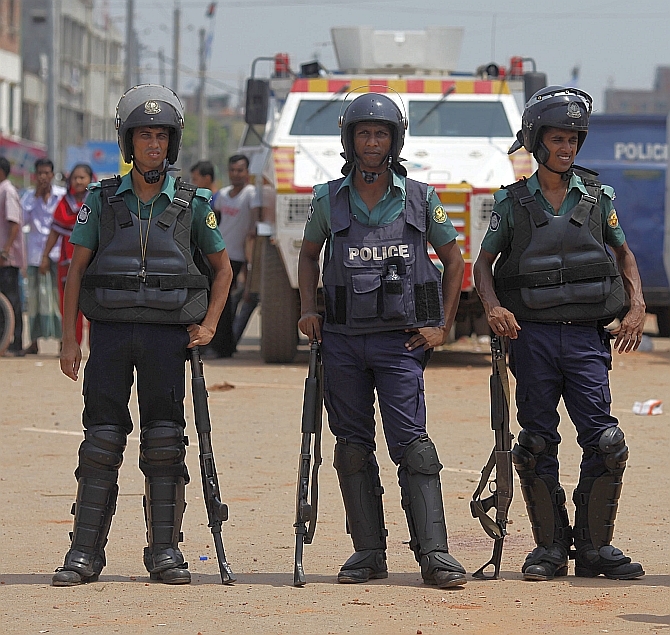 The Daily Star report, quoting Abdul Karim, assistant superintendent of Brahmanbaria police (sadar circle), said 15 people were detained so far in connection with the incident and several identified. Sunday's attack was carried out in a style followed by the attackers of Buddhist community in Cox's Bazar in 2012 on a similar allegation of disrespect towards Islam through a Facebook post. Deputy Commissioner Rezwanur told reporters that those responsible for the attack would get 'exemplary' punishment after investigation. "The opportunist quarter carried out this attack to embarrass the government. Those behind it will be found out and dealt with in a tough manner," he said.